On the surface, life in My Time at Portia seems downright idyllic. Then you discover that most of humanity was wiped out hundreds of years ago during an apocalyptic event. Suddenly, you notice the cracks appearing the town’s cheerful facade. The people of Portia have different ways of coping with this knowledge. While the masses turn to religion in an attempt to ban knowledge of the old world, the scientists embrace the old tech to pave way for new innovations. Unfortunately, while the game attempts to plant the seeds of conflict here, the early access build fails to deliver any meaningful choices. 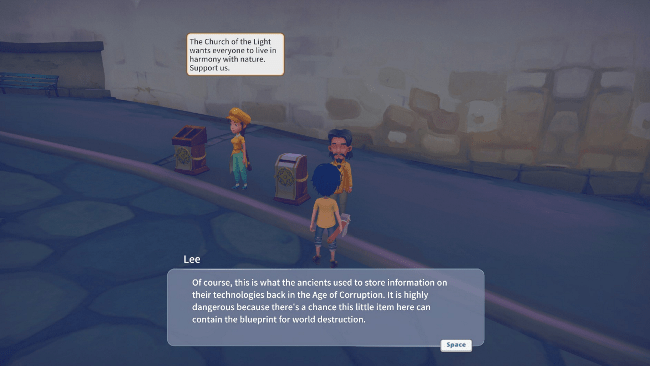 In My Time at Portia, the faithful follow Lee at the Church of Light. Along with Nora, Lee spends most days preaching in the city centers about the dangers of old world relics. Players can choose to turn any data discs they uncover in the ruins over to the church in exchange for ‘green’ tech. 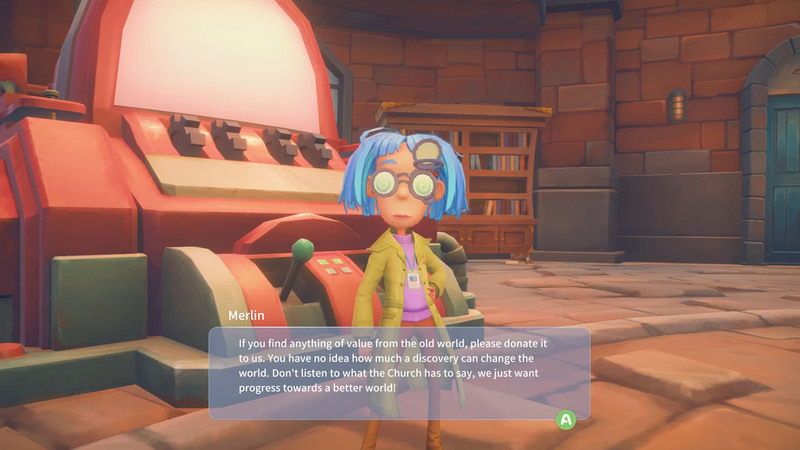 At the Research Center, Director Merlin and Petra work to uncover the secrets contained in the relics. While they recognize that some information could prove dangerous, they feel it’s worth the risk to help humanity develop the new world. Players discover this conflict relatively early in the game. After digging up a data disc in the ruins they need to take it to both Lee and Petra to learn more about it. Initially it seems like players will be asked to pick a side to support. Both Lee and Petra are adamant that the player should only deliver data discs to them and not the other side. Sadly, any semblance of choice is quickly removed by the game’s mechanics. 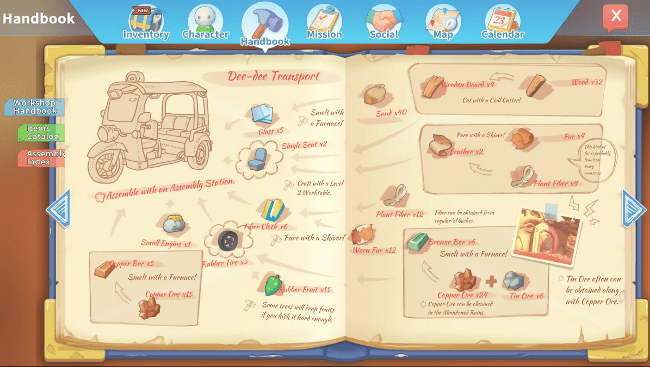 In order to advance in My Time at Portia players need to unlock blueprints to craft at their workshop. Some blueprints require specialized crafting stations to create their components. Stations and blueprints that the player can only receive by turning over their data discs to the Research Center. The Church Store offers mostly advanced seeds and planter boxes for farming. The seeds are helpful, but not required to advance the story. 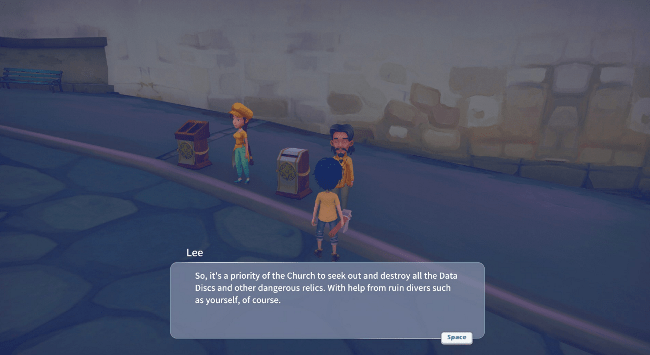 Lee assures the player that the Church isn’t against “useful” technology, but warns that any data disc could hold the blueprints for the end of the world. As such, he promises to destroy any that the player turns over to him. It’s a bit of a wasted opportunity to have the sides feel so unbalanced. Even though most of the town seems to support the Church’s position, it quickly becomes clear that they have no actual power. Meanwhile, the Research Center continues to offer humanity a chance to reclaim the technology it once held. As the promise of strife with neighboring countries looming on the horizon, Portia definitely has the potential to tap into some of its darker plot points. Hopefully, the developers will give players more choices to consider in future updates.